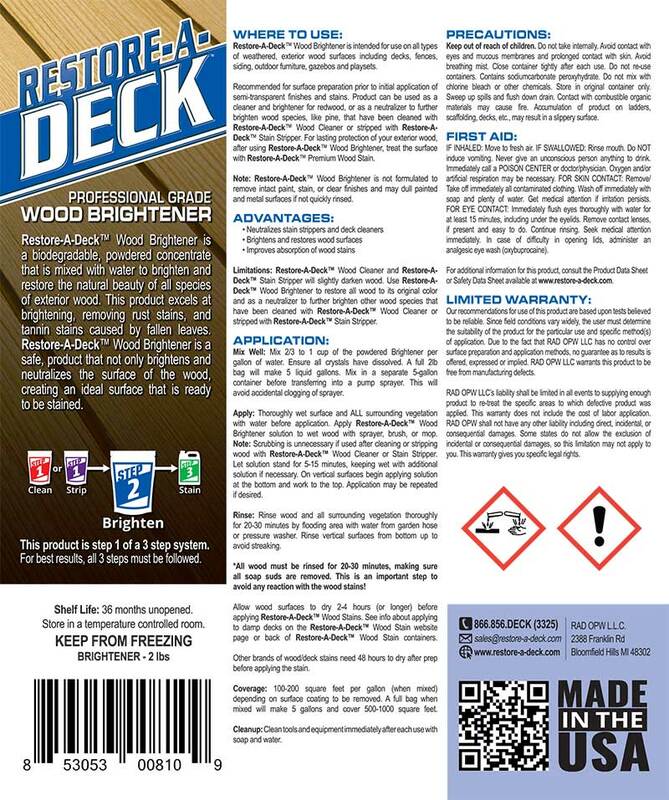 Clean and brighten your wood deck with this kit. You should not have to worry about fuzzies when already stained and yes the RAD will rep for another coat. Light coat will help. Last year I built a cedar deck and used the Restore-A-Deck cleaner/brightener on it before applying Armstrong-Clark Amber semi-transparent stain. Much of the cedar got sun-damaged and grey before I had a chance to stain it, and the deck cleaner left tons of fuzzy fibers that I had to sand off prior to staining (that's my fault for waiting so long, not RAD's fault). The stain on some of the horizontal boards is looking a little thin now, and I'm thinking about applying another coat of stain to the whole deck. Is RAD appropriate for prepping my deck for restaining? Is another coat on the whole deck a good idea? Will I need to worry about fuzzies again? You do not need the cleaner if using the stripper. I have an old deck (25yrs) still in good condition. I would like to strip old stains with RAD. I know I have to use the brightener also. Should I also use the cleaner if I have already power washed the deck? Please call office. They will replace what is damaged. Sorry about this. I ordered a pail of stain and this restore a deck package 600 and found them on the doorstep today. Opened the package with the 4 restore a deck containers and both containers of brightener were opened and spilled a large amount of the powder in the box and was all over the outside of the box. Let's just say I'm not a happy camper. Is there some way we can make this right? I took a couple photos of the package if you want verification. Yes all new wood needs to be cleaned and brightened before staining. The RAD products are mixed with water and best applied with a pump sprayer then lightly pressure washed or heavy scrubbed. Both stains would work well with new PTP wood. I am new at this, I have a new deck three months old it is PTW in the gold tone or cedar color. I think I will need to clean it before I stain it, is that right? 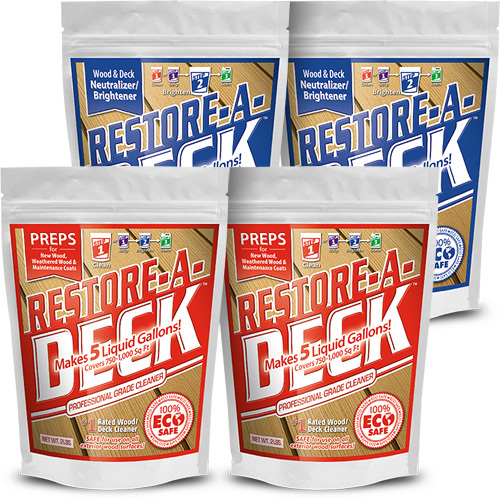 With the Restore-A-Deck package I see that I will receive 2 containers of Step 1 Wood Cleaner and 2 containers of Step 2 Wood Brightener. How is this product used? How long a wait time to do the staining? Also I see you recommend both Timber Oil and Armstrong Clark for the stain. Is one of the two any better for the new pressure treated pine? Penofin's clear/natural is not a true clear. It is a lightly pigmented stain. I used Penofin clear/natural with no stain. So it is not stain remaining. It is still black from mold/mildew. Would using bleach 1 time damage the wood? 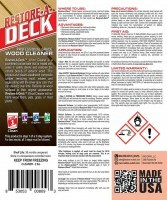 Step 1 is a wood deck cleaner not a stain stripper. I suspect that the old stain is not coming off completely. 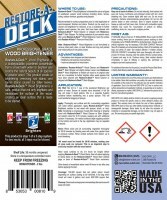 You could try the bleach but if that does not work then you should use a deck stain stripper ([url]http://www.opwdecks.com/wooddeckstrippers.htm[/url]). Brighten everything when done. 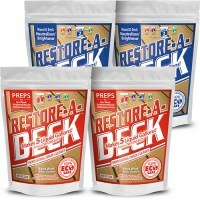 Sorry, forgot to specify, that I'm using Restore-a-Deck product. Just used step 1 on my Mahogany deck. Had to do alot of brushing to clean the black (mold and mildew). Had used Penofin last year, 1 coat when the deck was new. Will the brightener take the black spots off or should I spot treat them with bleach? I don't have any Deck cleaner left. I haven't used the brightener yet. It's a 2 day job. Most likely you will need to apply a stain if you do not have a coat on already or if your current stain has deteriorated. Do I need to reapply stain after using this? Thanks. Pre wet and rinse is all you need to do. Do shrubs need to be protected from this product or will rinsing off all areas prevent any killing of the plants? 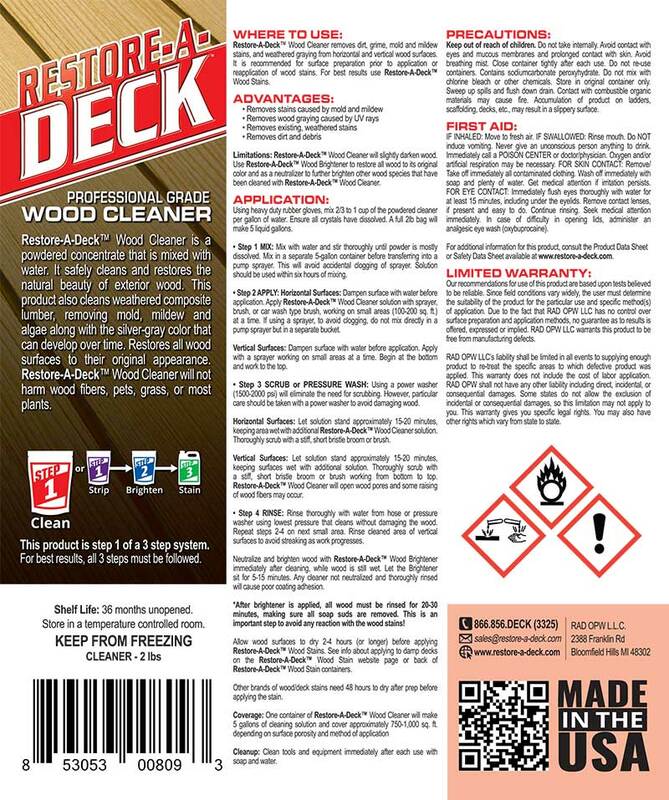 The Restore-A-Deck is a wood cleaner, not a stain stripper. It's purpose is to clean and remove dirt, grime, mildew, algae, uv graying, and to prep for reapplication of stain. If the old stain is extremely deteriorated, then yes it could remove a stain.